There are many great weather apps out there but nothing comes close to the coolness factor of Tom Scott’s weather app which was made for Star Wars fan. You see, apart from telling you the weather in a particular place which you enter on the site’s search box, the site also gives you different backgrounds and commentaries mentioning the different locations in the Star Wars universe. Well, of course aside from the commentaries, the weather report is actually pretty accurate because the site fetches weather data from Yahoo Weather. And while you’re at it, you might want to check out Tom Scott’s other creation which includes – Two Drums and Cymbal Fall Off a Cliff, The Corruscant Juggling Club and more. They are pretty cool stuff and makes you think that this guy is really enjoying his work. Tom Scott is a geek comedian. He won the 2008 Kevin Greening Award for Creativity at the Student Radio Awards, once got in trouble with the Cabinet Officefor his version of their Preparing for Emergencies site, and has been described as a”sometime internet funny man” by The Register. He runs the British part of International Talk Like A Pirate Day, and accidentally got elected as president of his students’ union after running as “Mad Cap’n Tom”. His work has been shown on BBC One, Channel 4, and at the paraflows net-art exhibition in Vienna. He also once got five gold runs on ‘Blockbusters’. 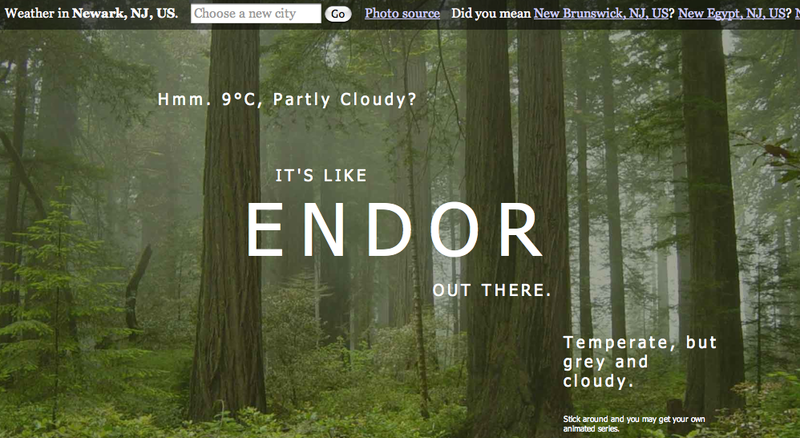 So, go check out the the Star Wars Weather app and tell us, how’s the weather out there?